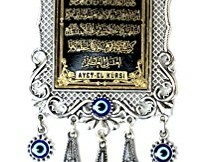 Metal wall hanging with Ayat-al-Kursi. 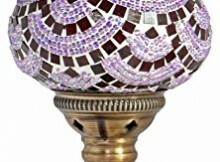 All metal wall decor with glass evil eye. All metal, written with raised letters in Arabic, Ayet-el-Kursi wall decor. Constructed of sheer, durable 100% polyester netting. 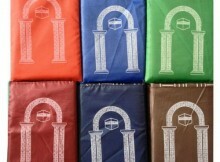 Available in a variety of colors to match any decor. Suspends from ceiling or four-poster bed. Some assembly required; hardware included. 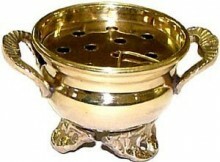 Traditional Greek Orthodox Censer for burning resin over incense charcoal, or cone incense. 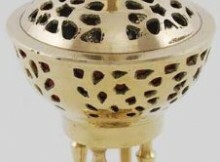 Includes bowl underneath lid for burning the incense. 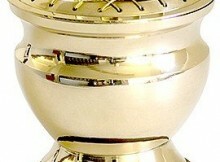 Approximately 8″ high. 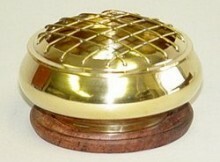 Beautiful solid brass black screen burner with golden carving. Black wood coaster is included. 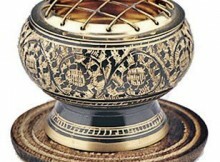 An artistic carved burner. 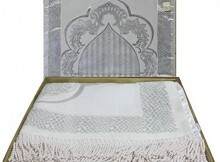 Quality thin Muslim Prayer Mat that comes in gift box. Perfect gift for Eid, Shahadah, Ramadan.